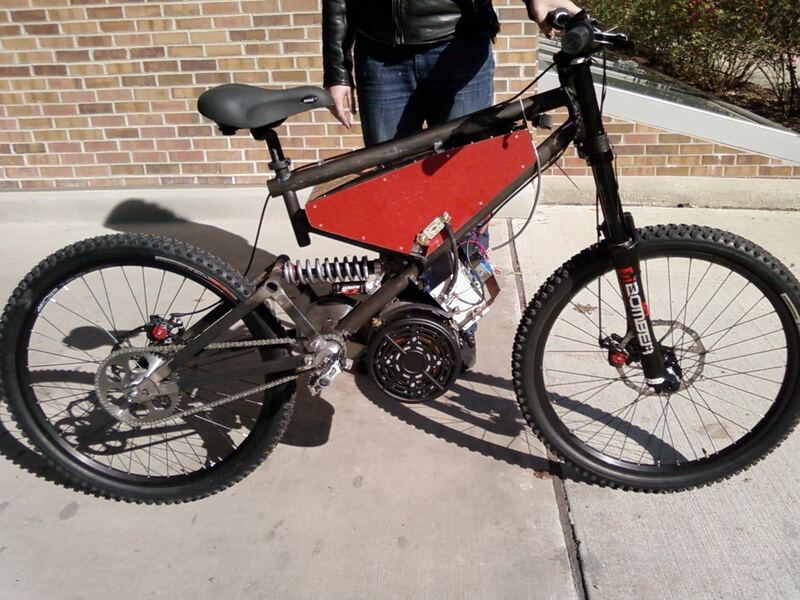 MAKE subscriber Jennifer Holt of Columbus, OH, wrote in to share her rather overpowered electric mountain bike, running on a 48V motor powered by a homemade battery pack consisting of 144 3.3V lithium ion cells. Data from the battery monitor is logged to an SD card. This is the second of the two electric bicycles I have made. The first was thrown together for a friend of mine on a very limited budget and used whatever we had lying around. It worked fine but looks like something you would see on ThereIFixedIt.com. For my own bike I wanted a much cleaner look. So I designed a frame from scratch to hold the components I wanted. Full suspension was important to me, since experience from the first bike showed that bumps were uncomfortable on a bike with an extra 100lbs on it. I also wanted off-road capability and more power than any sane person would want on a bike. I limited the top speed to ~30MPH by design, since I didn’t really want to go much faster on a bike-style frame(I have a yamaha FZ-1 for that). The low gearing and large motor leads to insane torque. I had to set the current limit in the Alltrax controller to half its max value, otherwise it was impossible to keep the front wheel on the ground. As it is, you still have to be careful taking off, it will throw you over backward if you peg the throttle from a standstill. Acceleration is limited by the friction between the rear wheel and the ground, you can lean forward to keep the front down, but the reduced load on the rear means that the drive wheel will slip, even on dry pavement. Unfortunately, Jennifer has already wrecked the bike and broken her elbow, but it sounds like she’s already begun to revamp it from scratch starting with a new powder coat on the frame. She also plans on sharing the CAD files for the various custom parts.